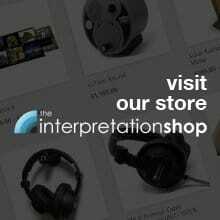 How Do I Create A Multi-Zone Surround Sound Museum Experience? EDIT: The SoundScape has been discontinued. 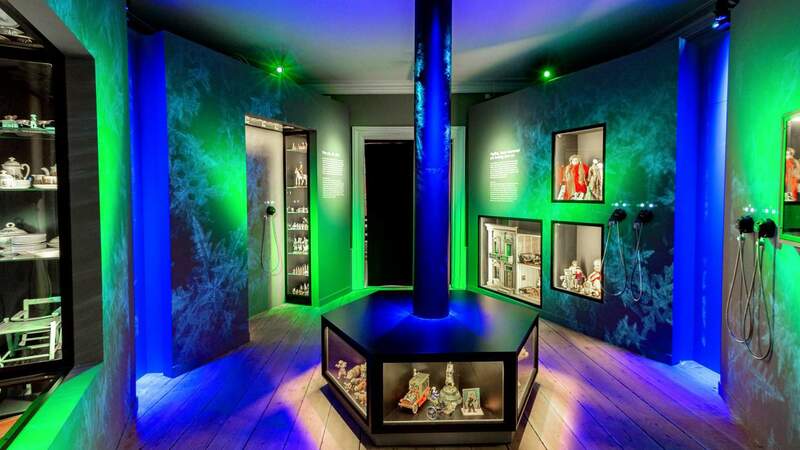 It’s been some time since we completed a ‘How to’ post, the last being ‘How do I create a museum video exhibit’ way back in 2013! So with the release of our Bespoke SoundScape we thought it was time to release another ‘How to’. 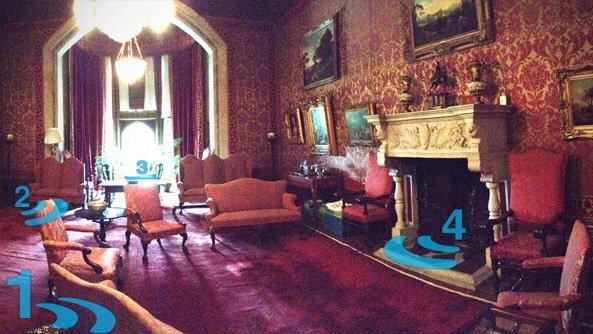 This one being how to create a multi-zone surround sound museum experience – which thankfully is a lot easier than it sounds with the use of a SoundScape! 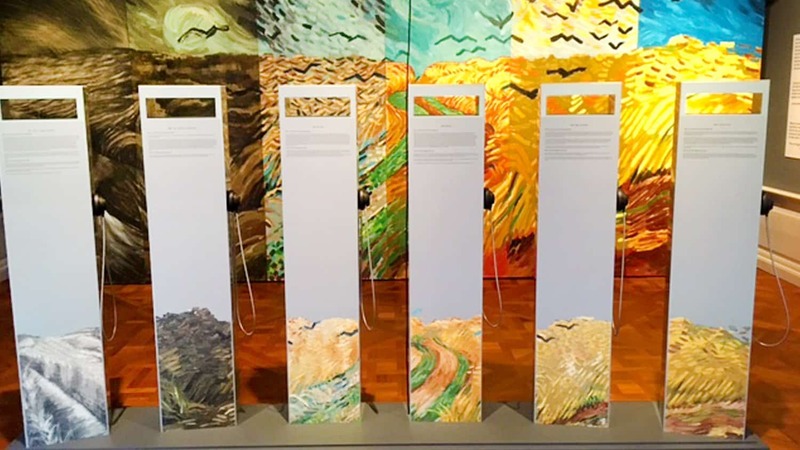 The SoundScape is one such audio source – providing 5 tracks through 4 channels (4 individual tracks and 1 background track which plays through each of the speakers). Speakers are connected via 4 screw terminals whilst the SoundScape can be left to play on loop or triggered via button input or PIR (passive infra red). Note: Speakers and trigger options are not included with the SoundScape. Put simply, the SoundScape lets you play different audio content in 4 sections of a room with one underlying background track. It does this in as simple a way as possible. Utilising a SoundScape in the above setting will look something like the image above. As mentioned the SoundScape allows you to play 5 tracks through 4 speakers. Track 1 is a background track which plays through all speakers whilst tracks 2 – 5 play through speakers 1 – 4 individually. Each track is programmed via a MicroSD card, simply add the audio file to the card and insert the card into the appropriate channel. In the above graphic each zone of audio is represented via a colour, the background track plays through every speaker (blue) whilst each of the other tracks plays through an individual speaker each. The choice of speaker depends upon a number of factors, such as the area size, how you intend to install them and the location (for example we’ve installed a SoundScape on a castle battlement which is somewhat exposed to the elements, requiring weatherproof speakers) – usually we will utilise VSP Atmospheric loudspeakers for their great quality and flexible installation options. Cable management is important – wires should be hidden where possible as well as the speakers themselves in order to maintain the immersion factor of the experience. 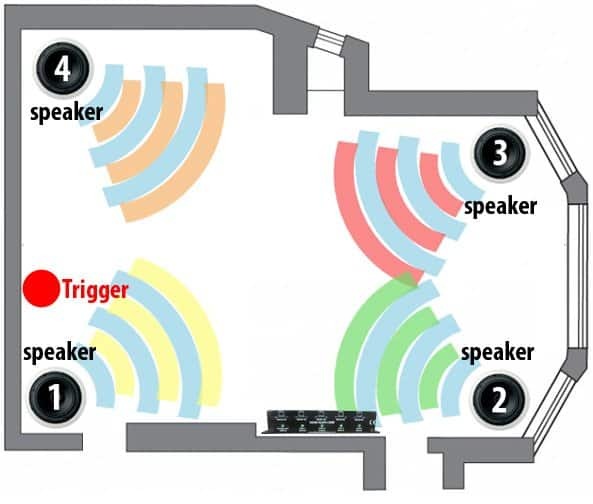 Speakers are wired to the available terminals as displayed above, with their individual volume levels set using the adjacent control (allowing you to fine tune the audio experience depending upon the shape and size of installation site). The third and final aspect of hardware required to make a SoundScape work is the trigger device. 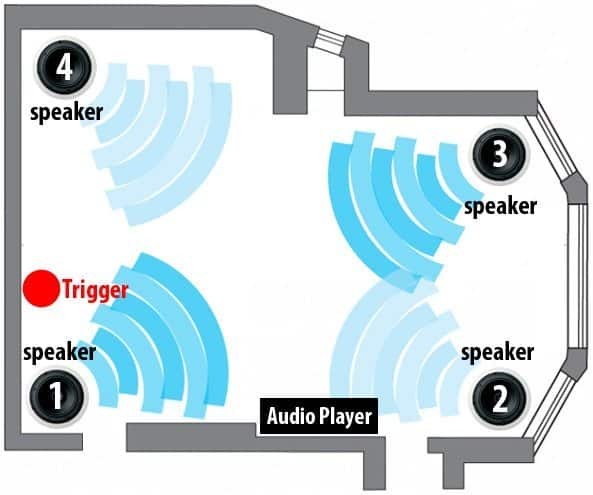 This isn’t necessarily required if the audio can be left on a loop however for real engagement it’s best to allow the users to trigger the audio in some manner, this can be via a button press or often a better option is via a PIR (passive infra-red sensor). A PIR can be set up to sense when a visitor enters a certain area, thereby triggering the SoundScape to begin – both a button or PIR can be used with a SoundScape installed via the Trigger Input. 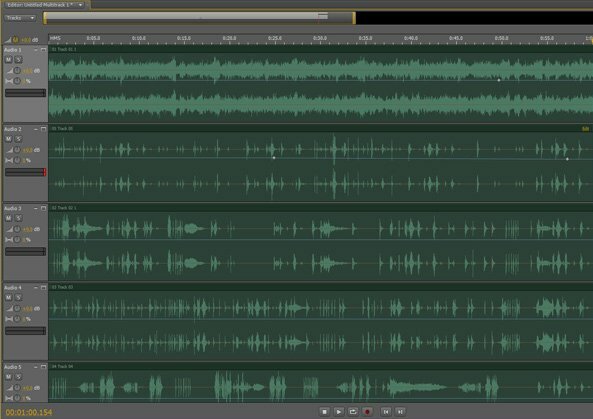 The next stage of creating a multi-zone audio experience is to produce the audio content (arguably the most important aspect!). This audio is comprised of numerous single tracks, the number of which depends on the amount of zones you wish to create for your experience. With a SoundScape there’s the option to utilise 5 tracks, one background track which plays universally and 4 single tracks for each of the 4 speakers. Obviously every installation is different and the type of content you use will differ vastly from site to site however one thing which remains constant is the need to layer your content. 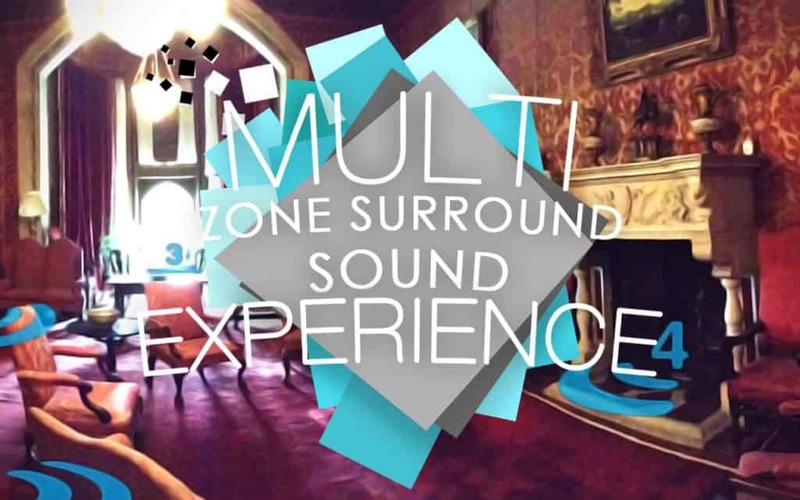 The background track should set the tone, creating the underlying ambience of the room/location whilst each of the zones should work together to create the surround sound effect – zones should dip in and out rather than play audio constantly simultaneously – drawing the visitors attention to different things at different times. The following are two examples of SoundScape’s we have used to great effect in very different locations. 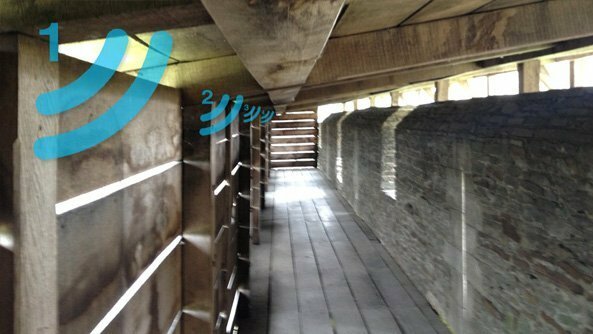 So there you have it… how to create a 4 zone surround sound experience at a museum or heritage site – made much easier with the use of a SoundScape! Feel free to contact us with any queries.